New York City is home to many wide-world known tourist attractions, bridges, skyscrapers, entertainment industry, colleges and universities, and not to leave out the two stock exchanges that are the world’s largest. New York City is populated rather densely, and actually the most populated city in the United States. So, needless to say, one may not have a problem finding a salon in this city! Here are some of the top salons in New York City. Nunzio Saviano Salon, located at 130 E 65th St New York, New York, 10065, 212-988-0880. This salon is two stories, and quite intimate and classic. It shares the owner’s namesake, who has become a New York City top stylist with over 20 years actively in the industry. He believes there are no “signature cuts”, as each person shall have a cut that is their own. Nunzio Saviano and his team have expertise in haircuts and color, offering services for both men and women. Shampoo Avenue B has been referred to as a very comfortable neighborhood salon from many clients. Clients that visit this salon always experience a dedicated staff with consistency, and on top of the every-changing trends or styles. Shampoo Avenue B is located at 14 Avenue B New York , New York, 10009, 212-777-2031. There are several levels of stylists, each specializing in specific services. As a whole, Shampoo Avenue B has been known for their expertise in bayalages and ombres. Over time, this salon has been featured in several popular magazines, such as Vanity Fair, Vogue, NY Post, Glamour, and more. Kiwa Salon’s stylists deliver high quality services as they have been educated and trained in the latest innovations from a renowned hair salon in Japan. They also have over 15 years experience in the industry, specializing in several services, including perms. Kiwa Salon is located at 234 W 27th St New York, New York, 10001, 212-620-3847. They use products such as; Redken, Milbon, Yubi, and Shinbi. 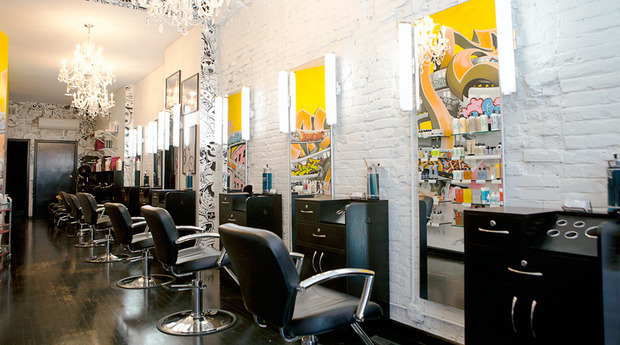 Alibi NYC Salon is located in the historic downtown district at 67 Greene St #2 New York, New York 10012 212-219-2806. This salon is a loft space in a beautiful and creative gallery. Staff uses organic, high quality hair products, and customize each color and seasonal haircut. Alibi NYC Salon has had numerous public achievements, and in both 2016 and 2017, they had been voted best hair salon for bayalage and ombre in New York City. The Drawing Room New York Salon is a SOHO hair salon that is very unique as they are inspired by the fashion industry and they make a commitment to each one of their clients to create the perfect style for them. This salon is located at 148 Spring St New York, New York, 10012, 212-226-2600. The Drawing Room New York Salon has partnered with several professional hair product lines such as; Catwalk, TIGI, Bedhead, and S Factor. NY Magazine had voted The Drawing Room as one of the “Top 10 Critics Pick”. 718-926-4050. Leslie Ellen specializes in curly hair as she has always been fascinated by the versatility and beauty of curls, along with having a passion for color and style.